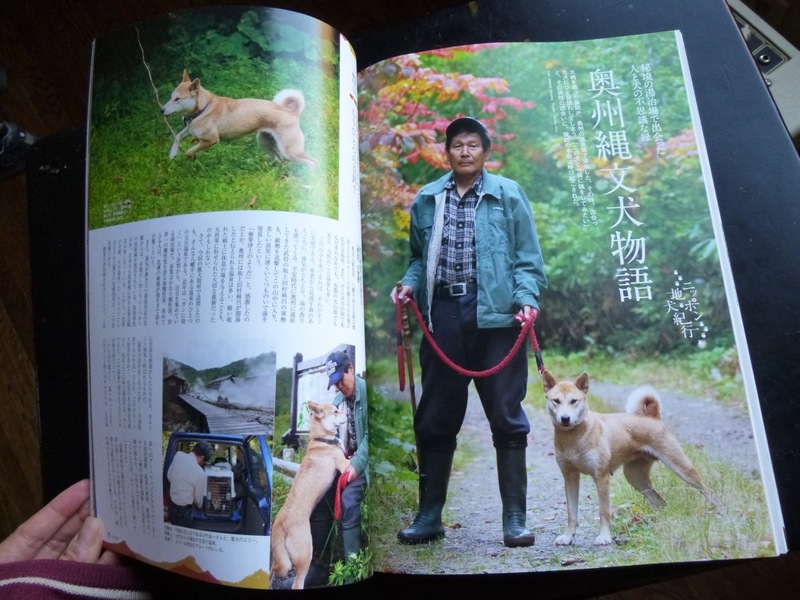 Trinkets, toys, and memorabilia related to Shiba Inu and Basenji dogs. 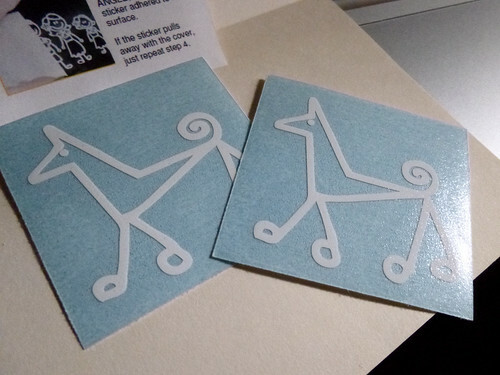 While I was away, I received my order of Basenji stick figure decals, designed by Linda S. of Sinbaje Basenjis. I think she’s now sold out, so I have to be VERY CAREFUL when I decide where these go! 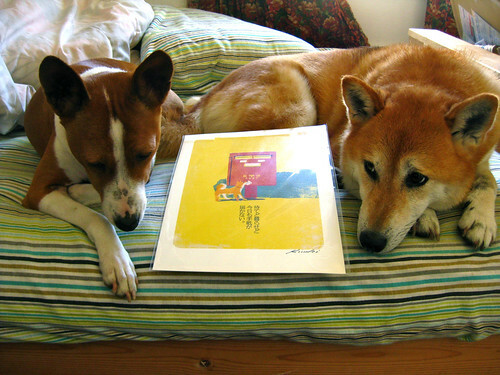 And after the warmup, I’ll move onto this Shiba set! 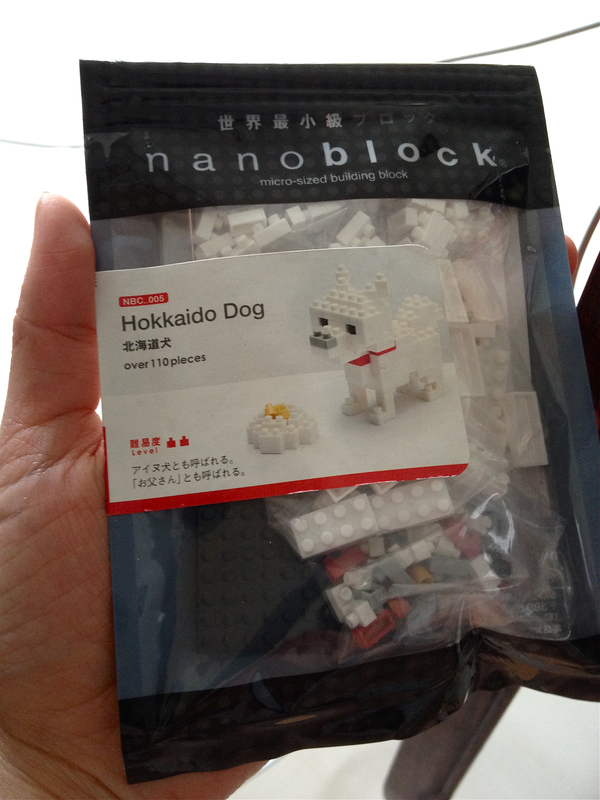 These pictures are huge on my screen, but these pieces are extra tiny — hence the name, Nanoblock. I’d probably end up accidentally flicking a piece across the room or up my nose. Hmm, maybe I feel safer just admiring the assembled product on the page of someone else who was more confident in their dexterity. 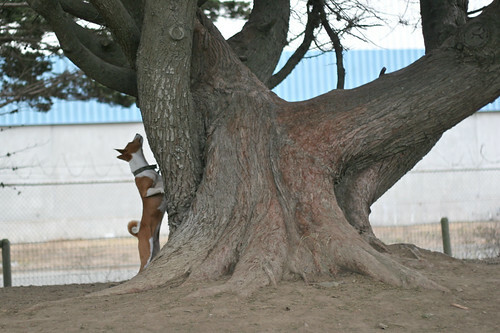 Edit: On second thought, these could be Japanese Akita too, given the size relative to the human figure! Hmm! 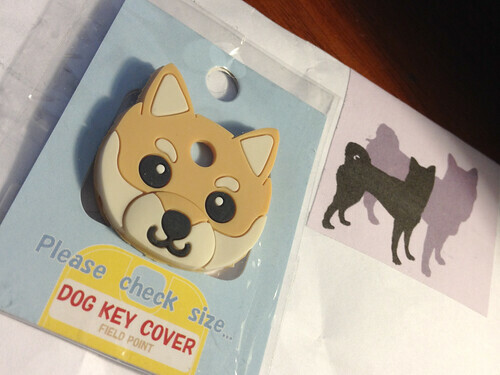 Thanks to Shio and Emi and Kaiju‘s people, a whole bunch of Shiba people in the U.S. now have our very own Field Point Shiba Key Covers. Possession of this object initiates you into some weird public cult. Instead of flashing these things at each other as we pass by wordlessly on the street, we post them on our blogs. 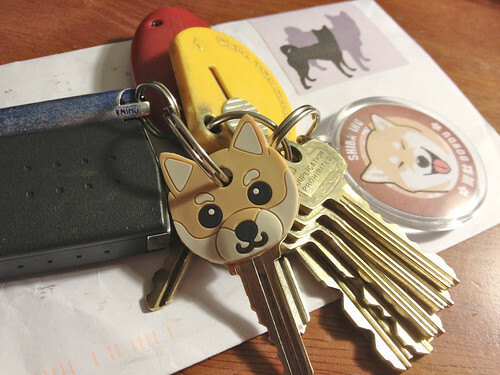 My clutch of keys is now doubly decorated with Shibas. 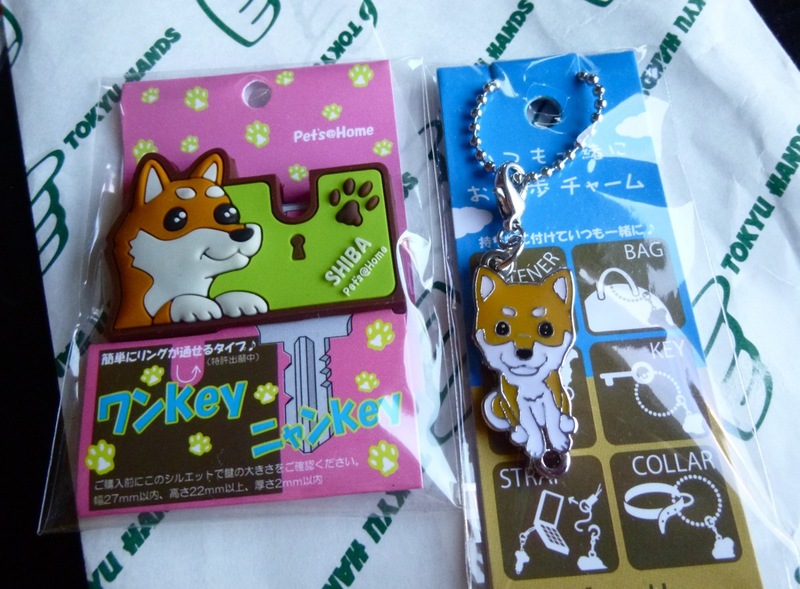 The personalized key ring came from Shiba Goods World (柴小物專門店) in Taiwan. They used to have a Facebook page, but disappeared some time back… I think they may have regrouped under a couple other names. 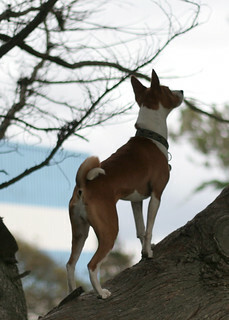 Unfortunately, Basenji trinkets that suit my tastes are generally harder to find. 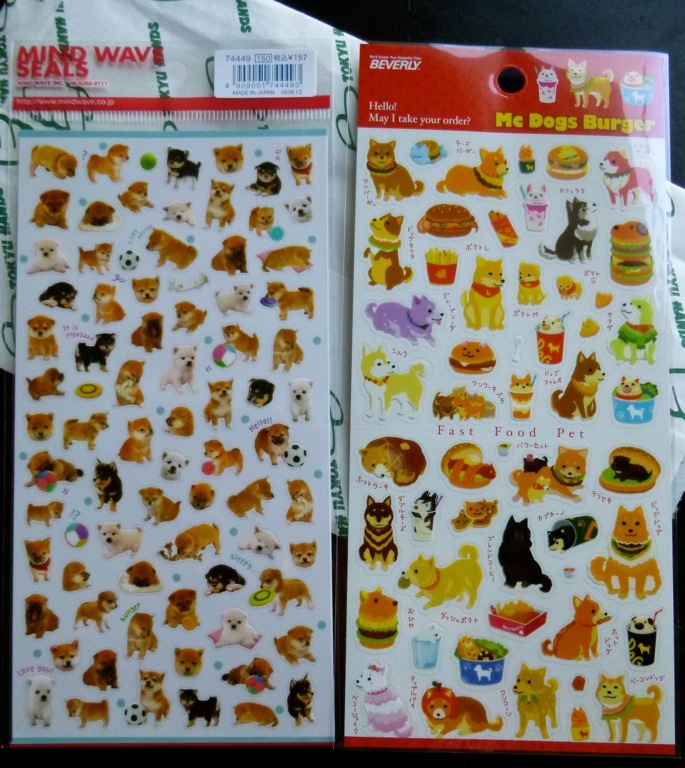 This is just as well, lest the house become dangerously overloaded with kitschy dog breed knickknacks and even more unnecessary (but totally cute) gewgaws! Who needs *stuff* when the Bows already have such presence? 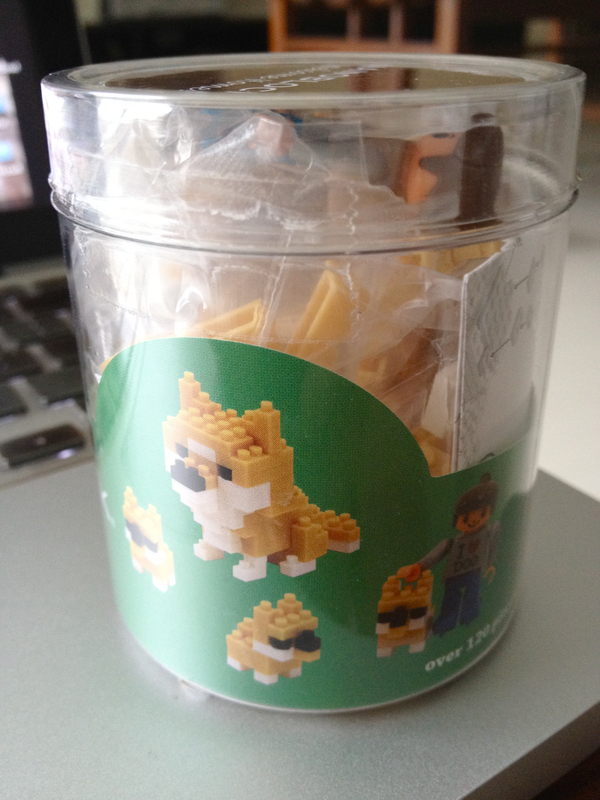 Item: Shiba Inu B@wbrick/Bowbrick figure. 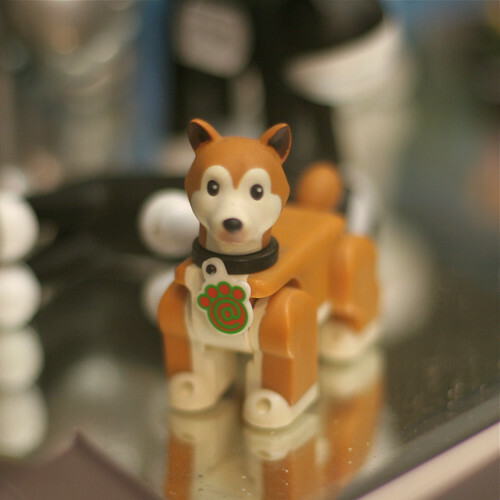 This is one of six in series 1 of Medicom’s dog-themed Kubrick toys. Released October 2002 in Japan. This figure was for sale at Jeffrey’s Toys on Market St. in San Francisco, priced at $6.98 (I think — the price tag was partially obscured on the other side, and I did not purchase it). 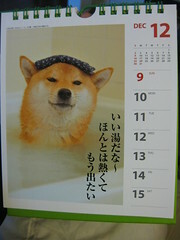 This image comes from Shiba Goods World (柴小物專門店), a Taiwan-based design group that makes limited runs of items featuring Shiba-centric images. I don’t have it in me to say more about disaster profiteers at this time [edit: I mean on a broad, impersonal level, NOT referring to any fundraising efforts I see happening from individuals whom I know genuinely care about and are affected by the unfolding events]. At any rate, this particular image is not for sale. 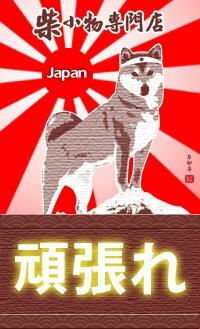 You’re free to download and use it to show your [non-commercial] support of the ongoing rescue and recovery efforts in Japan. Gifting afar, and bringing it back home: Our first GIVEAWAY! I had a rough theme for this week’s entries, shuttling back and forth between Here and There, Local and Global, the idea of using small acts to make a world of difference, even when immediate change is perceptible only in private… yadda yadda. Things didn’t cohere quite as I intended, but that’s why this blog is always a work in progress. Over the months, I’d been collecting goodies for a House of Two Bows giveaway, but it didn’t occur to me until this week how I was going to execute it. Not until I stopped by my local animal shelter and spoke to their volunteer director about their donation needs did I finally realize how I wanted to end this week. Photo taken 8 December 2010. Adoptable pound puppy Rusty. What can I say? 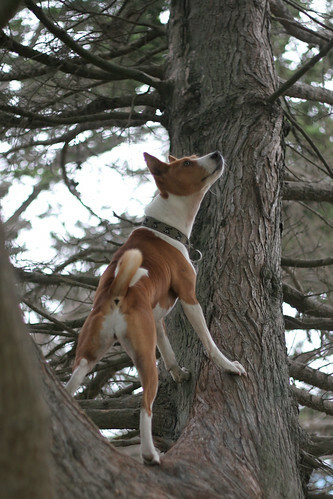 I’m a sucker for red dogs. My local animal shelter could use spare towels, blankets, bath mats. Durable chew toys and rope toys — big, black Kongs and whatnot. 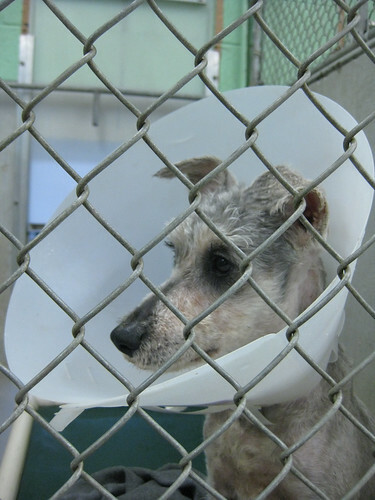 They’re doing okay with food, though they could sometimes stand to have more limited ingredient and hypoallergenic foods on hand for dogs with allergies. 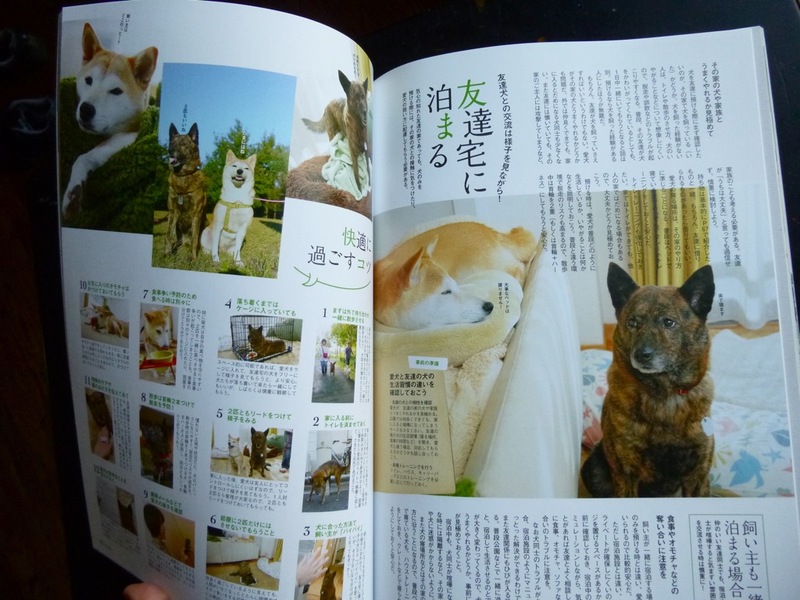 They could also use a few more beds for the dogs in their care. While Rusty the pittie above has his own bed, not every kennel is currently equipped to keep its resident off the cold, concrete floors. 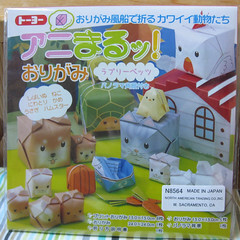 Animal Origami cubes by Toyo Japan featuring Shiba Inu and puppies, rabbits, turtles, cat and kittens, chickens. 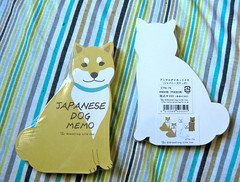 A diecut Shiba memo block from Greeting Life stationery. 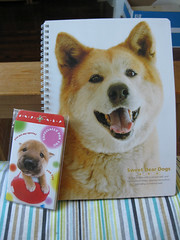 A B5 Notebook featuring a Shiba on cover from Kyowa stationery. 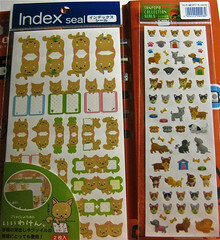 A set of San-X Iiwaken notebook tab stickers and one sheet of various dog stickers from Tanpopo. 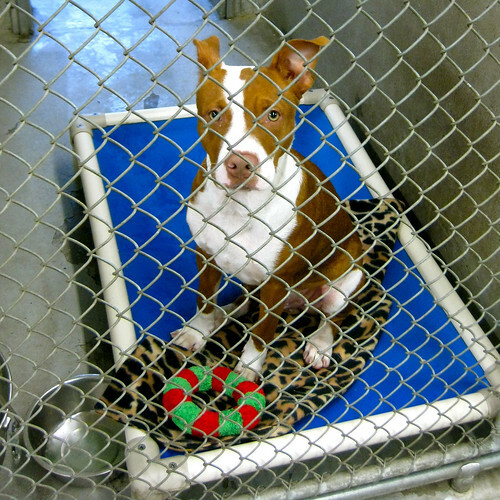 A Kuranda bed donated to my local animal shelter in your name. 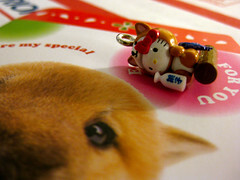 A DIY charm of Hello Kitty dressed up as a Shiba Inu — there’s a little silver loop attached to the tiny little figure, so you can turn it into a necklace, a cell phone dangle, or whatever (see below). 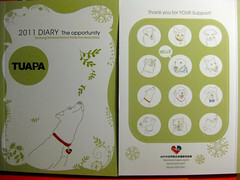 A bilingual Chinese-English 2011 pocket diary/planner from the Taichung Universal Animal Protection Association, TUAPA. 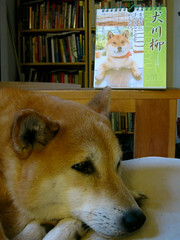 They did such a nice job with this, I ordered a whole stack to redistribute, as I really think they’re doing good work. All you have to do to participate is leave a comment to this entry below and answer the question: Where do your pets sleep? If you don’t have any pets at the moment, but would still like to enter, you can just answer where you think you’d like them to sleep. In order to be eligible, please make sure to fill in the e-mail address field when leaving your comment. AFAIK, your e-mail address will not be made public, but that way, I can contact you if you win. Entries will be accepted through next Friday, December 17th. One unique entry per pet will be accepted, though comments will have to be separated to count (yes, that means multi-animal households are at an advantage!). Unfortunately, comments for future or not-yet-existent or imaginary pets must all be consolidated under one entry. Winners will be chosen at random. They will be e-mailed privately after the close of the giveaway for their names and mailing addresses. Because I’m an inveterate packrat, and I go through periodic purges where I try to rehome a bunch of my possessions. Because I’ve been doing this blog nearly every day for months now, and I’m curious as to who’s reading. Because it’s fun to do giveaways, especially around this time of year. 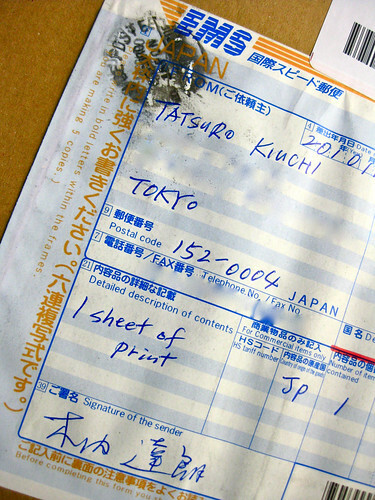 Because I love mail, both sending and receiving it. 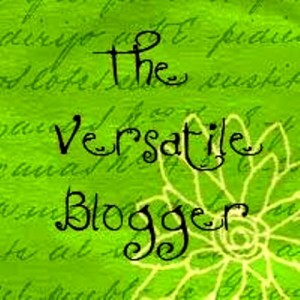 Because blogs have long been a medium for me to try and connect my personal life with the world that surrounds me in concrete ways, and this seemed a fun way to make that philosophy manifest. Ultimately, I’m doing this because I want to try and inspire a little bit of generosity in the world, a way to pay it forward, as it were. 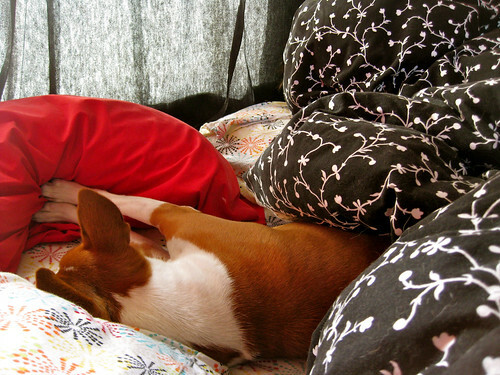 Our own dogs get to sleep in relative comfort, every night. And Bowpi has learned to stretch and expand into available space on the human bed, a habit which we actually find rather endearing. 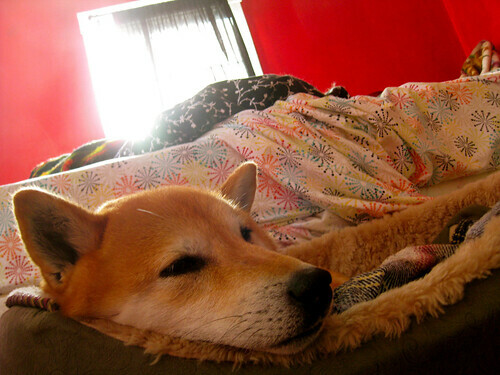 In their sleep, they appear to be such angels (perhaps why I have so many pictures of sleeping dogs!). 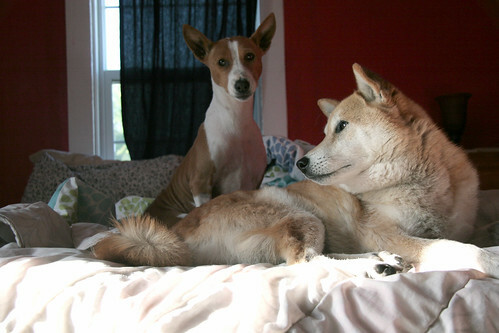 In their dreams, they are the epitome of “blissful ignorance,” for they can remain unaware of a less than cozy world. At the House of Two Bows, we may not be rolling in cash, but we’re doing okay. While we don’t have an answer for every pleading pair of eyes, and neither are we expecting everyone else to save them all, I think the least we can do is try and help others get to be okay, too. Then we’ll work on being more than okay, one step at a time. I love getting things in the mail! I had to order a print of my own. It arrived last week. There are many other whimsical, minimalist, and downright surreal pieces in the series. Check it out by clicking the link above. 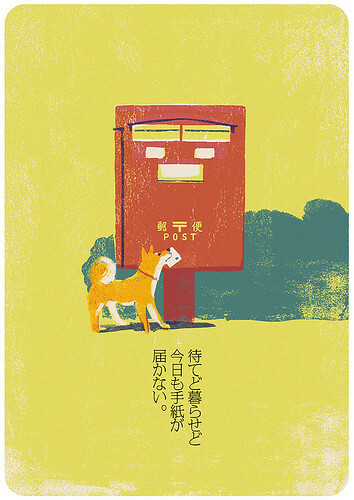 Inquiries can be sent to the artist at flickr@tatsurokiuchi.com. 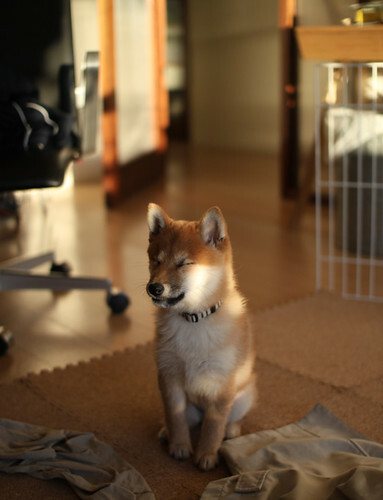 He also has a really adorable Shiba named Chai.